Written by: Dan Coplan on March 30, 2010. T-Rex Engineering was founded in 1996 by self proclaimed tech geeks and music freaks, Lars Dahl and Sebastian Jensen. The Danish company initially set out to develop high end MIDI gear for guitar but grew quickly and expanded to manufacture power supplies, pedal boards, and a slew of quality effects. With their ToneBug series, T-Rex strives to maintain the same degree of quality they’ve been known for but at a more affordable price. 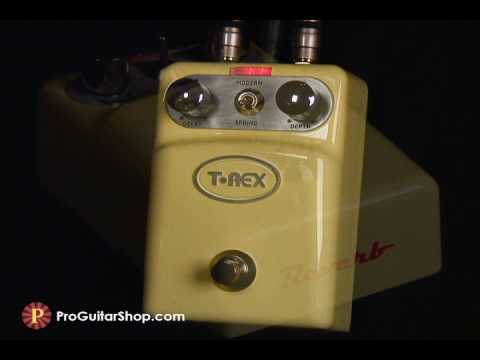 The T-Rex Tonebug Reverb Guitar Effects Pedal! The chunky pale yellow pedal is truly vintage in style. It’s simplistic, yet elegant with its rounded corners, gently sloping face, and chrome controls. If I didn’t know any better I’d swear it found use as some sort of appliance in my grandmother’s kitchen back when milk bottles were still hand delivered to her doorstep. The casing is all metal and the base is heavy duty plastic with a little bit of a rubbery feel. The pedal is hefty and I’d bet money it would survive a fall of several stories. Two shiny chrome knobs and a toggle switch on top serve as the controls and sit atop a brushed aluminum base labeled with the controls’ functions. The knobs are thick and turn smoothly with the perfect amount of drag to dial them into place where they’ll stay put. The switch toggles confidently. A wide rectangular ON light rests atop the pedal face just above the switch. The footswitch is equally heavy duty with good action on the spring inside and it’s well clear of the controls so there’s little risk of mistakenly kicking your settings. Metal input and output jacks on either side of a 9V power adapter plug are reinforced with hard plastic washers. The battery compartment is accessible underneath the pedal via a door that swings open. This makes battery changes so much easier than having to sit down with a tool and deal with annoying little screws. Additionally, the battery door is hinged to the pedal which greatly minimizes the chance of losing it. The day before sitting down to review this pedal I scored an Ibanez Jet King in mint condition off craigslist for a killer deal. My good friend Johnny DeMarco, a phenomenal guitarist, wanted to take the guitar and pedal for a test drive so I happily traded back and forth with him for the audio samples. The Jet King sports a pair of coil-tapped humbuckers and I found happiness in a blend of the bridge and neck pickup with the bridge in full humbucker mode and the neck coil-tapped. I ran my guitar through the pedal and into a Blackheart Little Giant Half Stack. No other effects were used. The knobs are labeled ‘Decay’ and ‘Depth’. The switch toggles between ‘Spring’ and ‘Modern’. The best way to think about this is ‘Decay’ defines the size of the space you’re in. Dialed all the way down is similar to playing in a short space while all the way up sounds like a very long and deep space. ‘Depth’ places you along this space. At a setting of zero it’s as if you’re playing in front of the entrance – most of the sound is dry guitar with subtle reverb echoing back. Diming this setting places you waaaay back in the back resulting in mostly reverb with very little dry guitar. The toggle transports you between two very different environments: a hallway for ‘Spring’ and a cave or very large chamber for ‘Modern’. The first audio example starts with a clean unaffected signal for reference and then clicks over in ‘Spring’ mode with decay set halfway and depth set at 3 on a scale of 10. This setting sounds like playing just inside the doorway of a medium length hallway. I handed Johnny the Jet King and turned the decay all the way up. This increases the apparent size of the hallway and dialing the depth a bit higher put him further back in the space. Dialing depth all the way for maximum effect gives the impression of playing from all the way at the back of the hallway where the reverb overtakes the dry guitar signal. We traded jobs as I slung the axe over my shoulder and Johnny clicked me over to ‘Modern’ mode. This completely transforms the space from a hallway to a large chamber or cave. With decay set halfway and depth just shy of that, lush and sweet reverb surrounds every strum. We traded again as I let Johnny finish up the last two samples. Maxing out the decay (increasing the size of the space) might make one feel smaller in size but the sound is huge. Finally, adding depth to match the decay at its full-up setting results in massive reverberations. Clarity is overwhelmed by the echoes as melodies become more of an all-encompassing soundscape. This pedal is incredibly authentic-sounding and I actually feel like I’m in the environments I set with the controls. The ‘Spring’ setting is enough to provide a basic natural sounding reverb but the ‘Modern’ setting opens up a wider range of possibilities and adds real value. Additionally, setting depth to zero (in either setting) results in no reverb but serves as a tone enhancer, giving the sound just a touch of sparkle and roundness. I don’t know that T-Rex had this in mind when they built the pedal so consider it a bonus. I love this pedal. T-Rex has constructed a rugged little brick of quality components and authentic-sounding reverb. I find the price a bit on the high side, however there’s nothing to complain about. Save up for an extra week and go get one. PROS: Rugged construction. Quality components. Versatile for a reverb and authentic-sounding. Very cool vintage look. CONS: Doesn’t automatically turn you into Brian Setzer. You have to practice for that. Otherwise, none.